Children in line to receive a hot meal at the Catholic mission in Duékoué, western Côte d’Ivoire. The United Nations Children’s Fund (UNICEF) appealed today for $1.28 billion to provide humanitarian assistance to children in over 25 countries this year, with nearly one-third of the total amount earmarked for the crisis in the Horn of Africa. “We have achieved many positive results in emergency settings in 2011 but the urgent and long-term needs of millions of children and their families will continue in 2012,” said Rima Salah, UNICEF’s acting Deputy Executive Director. The agency’s 2012 Humanitarian Action for Children report, launched today in Geneva, highlights the massive humanitarian operation in the Horn of Africa, where UNICEF activated its highest level of emergency response to run an operation to save the lives of hundreds of thousands of children and women on the brink of survival. 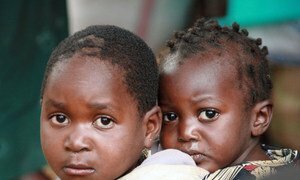 It also describes the nutrition crisis currently facing the Sahel region, as well as the emergencies in the Democratic Republic of the Congo (DRC), Chad and the Central African Republic (CAR), among others, that require funding if their most vulnerable people are to survive. The needs of children and their families displaced by violence stemming from the November 2010 elections in Cote d’Ivoire and the independence of South Sudan from its northern neighbour, Sudan, are also featured. The report also discusses the five million people affected by a second year of flooding in Pakistan and the operation to rebuild Haiti two years after an earthquake shattered the poorest country in the Western Hemisphere. In addition, it cites the humanitarian needs arising from the wave of political turmoil and change in the Middle East and North Africa, especially in Yemen, which is already affected by a long-standing emergency crisis. “This report presents some of the most extreme difficulties faced by children, but it also highlights the promise of a timely and effective response to their needs – malnourished children restored to health, children in conflict still able to learn, and all children, whatever their circumstances, better able to realize their rights to survive and thrive,” UNICEF Executive Director Anthony Lake writes in the foreword to the report. The United Nations Children’s Fund (UNICEF) today warned that two million children are malnourished as a result of the drought in the Horn of Africa, and half a million could soon die or suffer long-lasting mental or physical damage.